In my role leading work in both the Enterprise Architecture space as well as the IT Transformation space, I am frequently asked how IT4IT and TOGAF fit together, and how the Enterprise Architecture profession fits into the IT4IT context. My experience working with clients in this space has led me to look this question from two key perspectives. The first perspective is from the vantage point of the CIO using IT4IT to look at his or her organization for improvement opportunities. 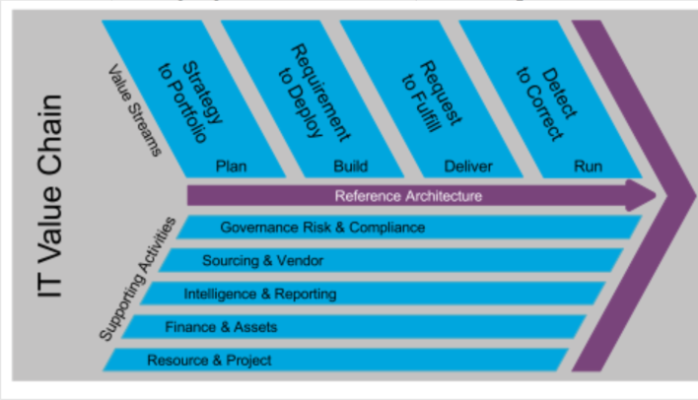 At this level of enquiry there are two primary views: the IT Value Chain and the Level 1 Reference Architecture. From this perspective, Enterprise Architecture is a small piece of the overall big picture. There are 29 functional components in the Level 1 reference architecture of which EA is simply one of many. Within the EA functional component it is appropriate to use whatever architecture framework we see fit, to guide process or best practices for Enterprise Architecture. TOGAF, along with counterparts like DODAF, FEAF, Zachman and others, simply fits into this box and needs to be integrated with other parts of the IT organization through the development of the Service Architecture. For a CIO, IT4IT gives me a way to look across my organization, and to assess all its functional components for quality or maturity (or whatever other factor is important) and to decide where my biggest pain points are. IT4IT also gives the CIO a very clear way to understand the data needed to manage an IT organization and provides a framework for evaluating how well that data is flowing across the different organizational silos. A second perspective for which IT4IT is useful is that of an Enterprise Architect. As an Enterprise Architect, it would be my job to look across the entire enterprise. We use the Porter Value Chain here as one simple representation of a way to segment your Enterprise Architecture according to TOGAF. As you can see from the highlight on the diagram, IT is one of several areas in the business. Each of these areas might have an industry reference model appropriate for use for one or several of the areas. Examples include ARTS, BIAN, SCOR, VCG, APQC or many others. 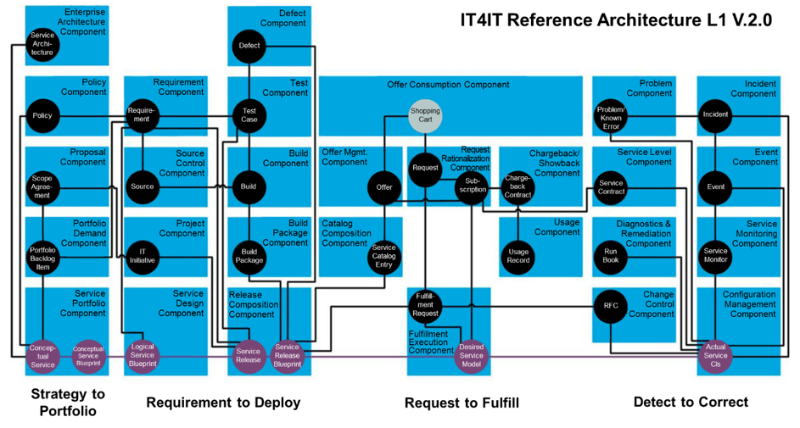 IT4IT in this context is simply a reference architecture for managing the Technology Development (or IT) support function. IT4IT provides us with the details we need to truly understand how IT needs to work. Neither perspective on how to use IT4IT is more or less important. The CIO can get significant value from using IT4IT in a top-down manner as a strategic assessment tool to drive improvement across the IT function and help transform the IT Operating Model. The Enterprise Architect can get significant value from using IT4IT in more of a bottom-up manner as a reference model to speed up architecture work and to drive vendor integration and standardization in the IT Management tool space. Regardless of whether you use IT4IT in a top down or bottom up manner, it helps to understand how the pieces fit together for you and your organization.